Nothing is better for art-on-the-go than this wire-bound pad of professional quality paper. 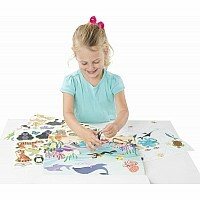 Sketch artists, of every age, will appreciate the handy size and the smoothly tearing edge. It even comes with two sketch starters inside the front cover! Measures approximately: 9.00 x 6.00 x 0.40 inches..